IKEA's Peterborough warehouse operates as a distribution centre to the company's local retail outlets. The warehouse itself is a significant size and, combined with the hard-standing required for the parking and turning of large articulated lorries, generates a significant rainfall catchment. The consequent run-off from the warehouse generated during rainfall events requires management and treatment prior to discharge back into the environment. The event-based nature of the flow, following precipitation events, meant that some form of balancing was required to handle initial high ‘first flush’ volumes. Run-off passing over the hard-standing areas picked up hydrocarbons from oil and rubber deposits from the lorries as well as grits. These would be present in higher concentrations within the ‘first flush’ and needed to be removed to acceptable levels prior to discharge. The Environment Agency specified a visual consent with a maximum discharge rate of 16.4 l/sec. 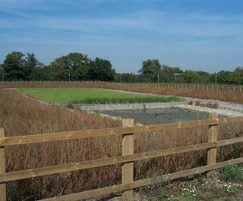 A suitable area was identified between the warehouse and a drainage ditch leading to a network of local amenity ponds. A spillway was constructed leading to an attenuation lagoon to provide some dynamic storage and to settle suspended solids and grit. One boundary of this lagoon was constructed using gabions which allowed the run-off to flow quiescently from the lagoon into a horizontal subsurface flow reedbed constructed on the other side of the gabions. This provides treatment including solids and hydrocarbon reduction before the run-off is discharged into a surface water course. The total area of the system is 2,570m2. 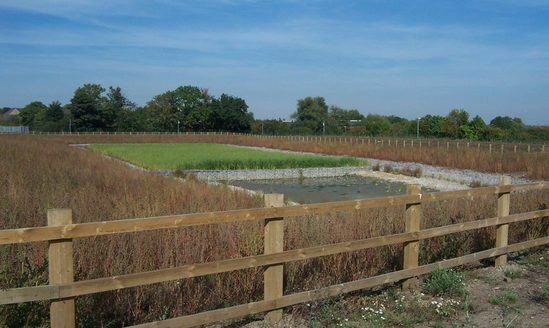 The attenuation lagoon and horizontal subsurface flow reedbed provide IKEA with a simple and robust, low carbon footprint run-off management and treatment system with low operational costs. The lagoon and reedbed blend in naturally with the amenity ponds nearby adding to the parkland nature of the local semi-urban environment and compensating for the impact of the warehouse.